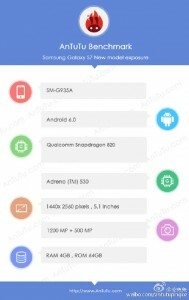 AnTuTu posted on its Weibo account the detected specs of the Samsung Galaxy S7, the 5.1" one (model number SM-G935A). This, as it turns out, is the Snapdragon 820 version, which has essentially the same specs as the Galaxy S7 edge+ version. The chipset is paired with 4GB of RAM and runs Android 6.0 Marshmallow (with TouchWiz, of course). This particular unit comes with 64GB of storage, but obviously that's no guarantee that Samsung will be moving up from using 32GB as base. And also no word on a microSD slot, as expected. The Galaxy S7 has a new camera setup – 12MP BRITECELL sensor on the back and 5MP snapper on the front. The new camera promises better low-light performance and a wider dynamic range compared to the current model. We will have to feign surprise when Samsung unveils the S7 lineup, we know its ins and outs already. One thing that's not 100% clear is how the Snapdragon and Exynos chipsets will be distributed across the 5.1", 5.5" and 6" models. There's a market for both 4.7 inchers and phablets. It's a matter of preference. Anyway I'm fairly certain an S7 edge+ will be rolling out with a 5.7" display.